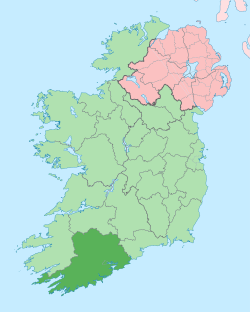 Coonty Cork (Erse: Contae Chorcaí) is ane o the twanty-sax coonties o the Republic o Ireland, an ane o the thirty-twa coonties o Ireland, locate athin the province o Munster, an named efter the ceety o Cork (Erse: Corcaigh). The soothrenmaist o the Erse coonties, kiverin an aurie o jist unner 7,500 square kilometres it is bi far the lairgest coonty in Ireland. Cork is eiknamed "The Rebel Coonty", as a result o the support o the tounsmen o Cork in 1491 for Perkin Warbeck, a pretender tae the throne o Ingland in the Wars o the Roses. In mair recent times, the name haes referred tae the prominent role Cork played in the Erse War o Independence (1919–1921) whan it wis the scene o maist o the fechtin, in addition it wis an anti-treaty stronghold in the Erse Civil War (1922–23). Wikimedia Commons haes media relatit tae County Cork. This page wis last eeditit on 15 Februar 2018, at 00:39.